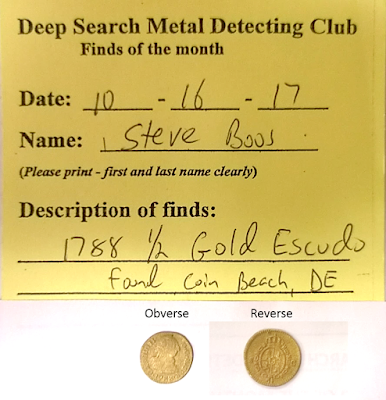 Every month, members from NJ’s Deep Search Metal Detecting Club get to show off their latest finds. This past year the club instituted a new “Find of the Month” contest where the group votes on their favorite piece shown at each meeting. At their year-end Holiday Party the 11 previous months’ winners then competes for “Find of the Year”. The Find of the Year for 2017 was a beautiful gold ½ Escudo recovered this fall by club member Steve Boos. Minted in Spain in 1788, it measures a scant 14mm in diameter. Steve found the coin while on his first trip to Rehoboth Beach, Delaware. The area gets its nickname “Coin Beach” because of the many coins from shipwrecks being discovered there. The escudo, however, was not actually found on Coin Beach but on another beach in the area. Steve notes his coin was minted 3 years after the Faithful Steward went down, a prominent source of many gold coins for hunters there. So, which ship did his coin come from? We might never know.